How Much Does it Cost to Refinish Kitchen Cabinets in 2019? Are you tired of those old timeworn surfaces on your kitchen cabinets? Maybe you want to rid your cabinets of scuff marks, scratches, cracks, and possibly even your kid’s stickers. Rather than going to the expense of replacing your kitchen cabinets, why not refinish them instead? Replacement cabinets can cost tens of thousands of dollars, rather than the $2,500 national average for refinishing kitchen cabinets. 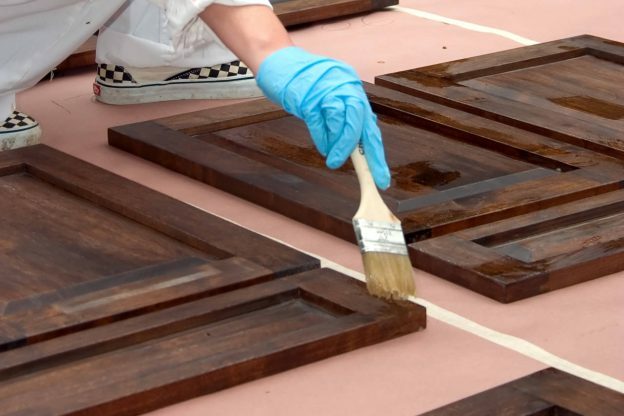 Most spend between $1,500 and $3,500 for the project and depending on where you live, the cost for refinishing could be more or less, hinging on the value of labor in your area. Cabinet refinishing is mostly labor and costs very little for materials. Across the country, and even from urban to rural, labor costs vary substantially; $32 to $100 per hour. Before you decide on a DIY project that might leave you without a kitchen for two weeks or more, at least get a few estimates. You might be surprised by the results. To prepare those old cabinets for a new finish, you will need to remove all the old coats of varnish, stain, or even paint. Then, all the doors, hinges, and hardware need to be removed. If they are in good shape and you still like the look of them, you could reuse them. You can usually get new hinges and knobs for $1.00 up to $7.50 each. The odors from many paints and varnish removers can be hazardous to respiratory health, so make sure there is proper ventilation and use a safer, biodegradable gel product to remove the old finish. Even when the remover states it is safe, you do not know what is in the old paint or varnish. Always use a respirator when using chemical products or sanding. Most gel products will strip 30-50 square feet per quart, so a gallon will remove 120-200 square feet of paint or varnish. Most varnish and lacquers will come right off after a few minutes of the gel application. However, semi and full-gloss enamel paints could take 24-48 hours, and more than one application. After the old finish gets removed, all holes and cracks need to be filled with a high-quality wood filler. These come in different colors, so try to match the stain or varnish you will use to refinish your cabinets. Figure $300 to $500 just to repair and prepare your cabinets for refinishing, depending on how many linear feet of cabinets you have. The more time you spend repairing and preparing your cabinets, the better they will look with a new stain, shellac, lacquer, or even paint if you choose. You could create a rustic look for your newly refinished cabinets with brushed on stain and varnish that matches your hardwood floors or tiles. Alternatively, you could decide to go with shimmering mahogany, cherry, or teak that matches your backsplash tiles or framed wainscot wallpaper, and use ceramic pulls of a similar or contrasting color. However, most will want to create a fabulous new look with a satiny stain, and one or more coats of polyurethane. Many choose contrasting colors for knobs and pulls; like shining finish with dull or matte-finished pulls. To determine how much stain, varnish, or lacquer you will need to check our paint calculator. Stain covers between 150 and 300 square feet per gallon on cabinets, depending on the porosity. Varnish will go as high as 400 square feet per gallon, and polyurethane can cover 600-700 square feet, but will need two or three coats. Keep in mind labor cost is the most significant expense. When a contractor gives you a flat price with definitive specifications, make sure you know what’s included in that quote.